Brackett Heating and Air is happy to provide Lennox’s revolutionary SunSource® Home Energy System. 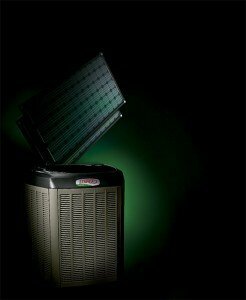 It starts with one of Dave Lennox Signature® Collection air conditioners or heat pumps. These units are solar ready, which means solar panels may be set up at the time of installation or upgraded at a later time – it’s your choice! With the addition of as few as one panel or up to as many as 15 to create a complete system, these solar modules use the sun’s energy to heat or cool your home. And when your heating or cooling system is not in use, the solar power can operate other appliances in your home. In some locations, surplus power may go back to your utility company for a possible credit on your energy bill! In the last 10 years, the average retail price of electricity for residential consumers has increased nearly 40%, according to the U.S Department of Energy. The U.S Department of Energy also accounts heating and cooling for 56% of the overall energy consumption in the typical U.S home. With the increasing electricity costs, the U.S solar industry is growing rapidly. There are now a number of possible tax credits that can be applied to offset the cost of the initial solar installation, some as high as 30%! 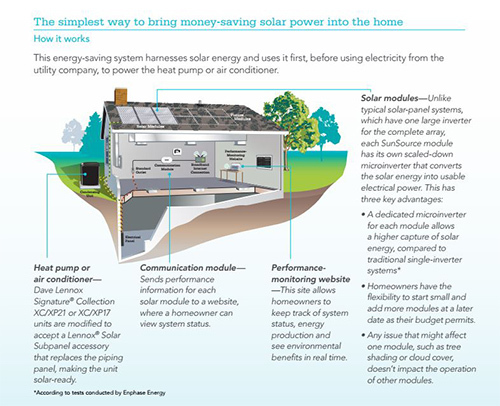 With cost savings like these, an investment in a SunSource® Solar-ready system may cost the same as a high-efficiency home comfort system without the solar capabilities. If you’re ready to revolutionize the way your heat and cool your home, give Brackett Heating and Air a call, or click below to schedule a free estimate.